Welcome to week 3 of How To Beat The Winter Blues! How did you get on with last week’s strategies, for keeping your energy levels feeling great this winter? I’d love to hear how you’re getting on, over at the forum. This week we’re moving on to your Monkey Mind and the vital role it plays in the winter blues. It’s not winter that’s the problem – it’s the stories we tell ourselves about it. When it comes to dealing with the winter blues, your Monkey Mind (the chattering bit that runs a commentary on every aspect of your life) can be your worst enemy. It can take a cold breeze and turn it into a gale. It can take a few spots of rain and turn them into a downpour. It can take a few flakes of snow and turn them into a blizzard. But your Monkey Mind can also be your best friend, when you know how to handle it. 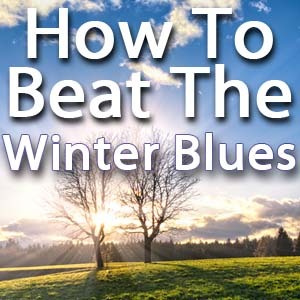 Want to discover How To Beat The Winter Blues? Join this online course today and you can start changing your life in the next five minutes. Want to join in with this course? Upgrade to discover How To Beat The Winter Blues today. Have you ever noticed how much we all love telling stories? I’m not talking Jackanory here – we’re much more subtle. Our ‘monkey mind’ (the part of us that does the running commentary, whatever we’re doing) is rarely off-duty and relishes a little drama. It believes that life without our own personal soap opera would be about as exciting as Christmas without the cranberry sauce. Is it time to stop feeding your monkey mind? And the thing is that the monkey mind is far from being a neutral observer. It much prefers to pass comment on everything that’s going on, feeding the currently-favoured emotion like bellows on an open fire. And I had a lovely reminder of this a little while ago. I was feeling particularly grumpy and glum (yes, running a blog on happiness and stuff doesn’t mean I’m Pollyanna all the time!). I was in the middle of a major melt-down of some renovation work at home, but grumpy & glum really weren’t called-for. And, curiously, the more I put my “fix it” hat on and tried to rationalise myself out of the emotion, the worse I felt. Then the words of a Buddhist meditation teacher I once knew came to mind. Any thought or emotion, left to its own devices, will eventually complete its cycle and go. And that’s exactly what I was doing that time, when I was feeling down. By trying to analyse and understand why I was feeling the way I was, my monkey mind got to stoke those fires way before each 60 second segment was through. And, before I knew it, it was 2 a.m. and my frustration was growing into full-blown anger. Yet had I just accepted the emotion of frustration when it was tiny, it would have quickly moved on and I’d have felt better within minutes. Instead, I kept telling myself more and more stories that wound me up further, constantly trying to paddle upstream, against the flow. I wasn’t just thinking one grumpy and annoyed thought – I was feeding an army of thousands of them. Feeling happier and at least ‘ok’ about things didn’t stand a chance, while I was actively inviting grumpy thoughts into my mind. Have you noticed how your Monkey Mind likes to tell stories about what’s going wrong? Even when you’re not feeling particularly down, if it spots a trigger, it uses it as an excuse to start up the story machine again. Life is an objective, sensory experience, until you label it and attach the event to a story. As soon as we use a label or put an experience into a particular box, we lose our flexibility and choice over how to respond. ‘Life’ isn’t ‘bad’. The stories we tell ourselves about life create the stress. It is believing your thoughts that causes the pain. Much (though not quite all – as we’ll come to in future weeks) of our experience of the winter blues comes from believing the stories your mind is telling you about it. Yes, some events have the power to trigger more stress than others, but ultimately it’s up to us to choose how to experience life. 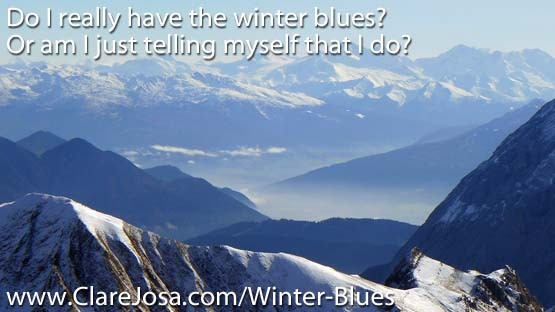 Do I really have the winter blues? Or am I just telling myself that I do? You are the author of your own story. So you can choose which story to write. The quality and ‘tone’ of our thoughts has a profound impact on our experience of life. BUT: Telling your Monkey Mind to stop thinking thoughts that make you feel miserable doesn’t work. Your mind can’t process a ‘negative’. I mean that if you shout at a child, “Don’t run!” it first has to imagine ‘running’ and then the ‘not’, by which time the accident has probably happened. If you tell them, “Don’t fall over!” then it first has to imagine falling over, and you can guess the rest. Instead of shouting, “Don’t run!” you could try “Walk!” Instead of “Don’t fall!” how about “Stay safe!”? Can you sense the difference it makes? Tell your Monkey Mind, “Don’t think negative thoughts!” and it first has to imagine the “negative thoughts” bit and… you guessed it… it never gets round to processing the “don’t“! How To Turn Things Around? You’re not trying to ‘banish’ the sad or angry thoughts. In fact, that would just make them stronger, as we beat ourselves up for ‘daring’ to think an unhappy or unkind thought. Give your energy – your attention – to a thought that you don’t ‘want’ and you are feeding that thought, allowing it to grow and continue. Instead, we’re simply looking to tip the balance in favour of the happy and more empowering ones, one day at a time; one thought at a time; no ‘forcing’; no ‘have to’; no ‘getting rid’; simply choosing to play with feeding the thoughts that lift our spirits, one at a time. I hope you find today’s strategies helpful. I’d love to hear how you’re getting on – over at the forum. I enjoy choosing which thoughts to feed. Next week I’ll be back with insider secrets for how you get moving – discovering the power of simple stretches to unlock your energy and set you free from winter lethargy.